WHERE: East Bay Trail at the Riverside trail head. Directions: Take I-95 south to Providence Rhode Island. In Providence take Route I-195 East. Take exit 4 (Riverside) to Veteran’s Parkway. The parking area (the large parking lot at the top of the hill) is approximately 1/4 mile on your right. 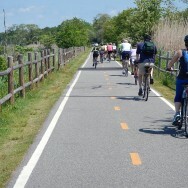 WHAT: A 90 minute (one way) leisurely ride all on the bike trail that goes along the East River waterfront and through several quaint towns in Rhode Island. We will stop for coffee in Bristol and then return to the trail head parking lot.